Forget snow. In Florida this week Mother Nature decided to throw down a few tornadoes to ruin everyone’s Christmas dinner. And nowhere was she more nasty than in Daytona Beach, home to Embry-Riddle Aeronautical University. According to reports, at least two tornadoes ripped a 100 foot swath across the campus, destroying the university’s maintenance hangar and destroying or damaging the majority of aircraft that were parked. 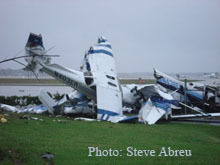 The university now says that about 50 of its 65 aircraft were destroyed or damaged.